Bathrooms: 3 "Full Bath(s): 3"
You will love the tranquility and exclusivity of this Santa Barbara at Bajamar condominium. Beautiful, unobstructed sweeping views of the Pacific Ocean, Golf Course, and sunsets. This end-unit condominium includes 3 large bedrooms all with ensuite baths. Recently upgraded with a new two way electric gas fireplace with remote start and privacy blinds. New LED spots lights in all the rooms and terrace. New floor to ceiling glass sliding doors in living and master bedroom. The master bedroom features floor to ceiling sliding glass doors that lead out to the main terrace, black out blinds, a jacuzzi tub, granite and travertine bath with jacuzzi tub and a large walk-in closet. Fully equipped kitchen with granite countertops, electric stove and oven, microwave, GE profile refrigerator and wine refrigerator as well as dishwasher. Large outside terrace with some of the best views in Bajamar. 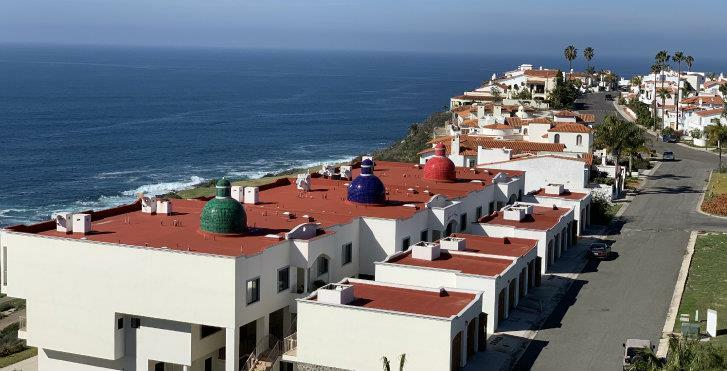 This is a secure remote access condominium with two side by side parking spaces, ocean view heated salt water pool, jacuzzi, BBQ and firepit Bajamar is a ocean front gated community with a 27-hole golf course, hotel, restaurant, bar, vineyard and event center. Just 15 minutes north of Ensenada, 30 minutes from the Guadalupe Valley and 45 minutes south of the San Diego Border.